I had the privilege of being part of the book launch team for Bonnie Gray’s “Finding Spiritual Whitespace”. This book is a much needed oasis that speaks truth into our hurried lives. Bonnie weaves keen spiritual insights and revelations into her story of a difficult childhood which led to unexpectedly dealing with PTSD and the ravaging effect that had on her as a whole person. She speaks from a deep well of experience, and relates definitive mile-markers of spiritual growth, where God divinely showed her how much her soul desperately needed to seek Him, to slow down, to rest. She calls that “spiritual whitespace”. I’ve also heard it referred to as “margin”. You know – that extra room on the side of a lined piece of paper that is supposed to stay empty. Have you noticed how that beautiful white, unfilled space on the page makes the whole thing more readable? That is exactly what whitespace is supposed to do – in art, in music, in life. As Bonnie tells us, if we don’t build it into our lives, if we don’t plan for it, if we don’t arrange our day to make sure it happens, if we don’t look for God along the way where He is showing up time and again, life will surely take over our agenda and our calendar and we will not naturally make room for Him in the process. We must slow down, we must have eyes to see, we must let our soul feel His stir. 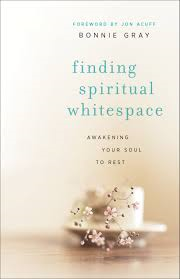 If your soul needs rest and if you want to find ways to incorporate God into your every moment, then Finding Spiritual Whitespace is a must read for you. The book also has questions at the end of each chapter and journaling prompts, to further your study alone or with a friend(s). Thank you, Nina! Building margin into my life is something I work on constantly - I'm sure we all do to an extent. That's why her book resonated so much with me- she reiterates the necessity of that extra space! I'm behind you in the review linkup. God has been speaking to me about soul rest for almost 2 yrs now. This book is so very timely. What a season it's going to be for us all. God bless. Thanks for stopping by and reading Jeri. I agree with you - this is timely. And we all need soul rest- our lives are too packed. Saying "no" can be a good - and very spiritual! - thing. It allows us to say "yes" to God more. I wrote a review also. it is a wonderful 'inspiring' challenging book.